We will receive you on arrival at the airport / railway station/ bus station. We will help you check in at the hotel. You can use the rest of the day to relax and explore the hotel facilities. 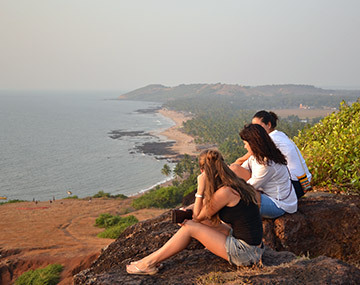 The landmarks of both North and South Goa can be explored today. After a scrumptious breakfast, we will take you around to a guided tour. The beaches and markets of Goa beckon you. Hire a bike and explore the sights and sounds that is Goa. We will bid adieu to you today. After a hearty breakfast, we will drop you off at the airport / Railway station/ bus station, and wish you a safe journey back home, hoping that you enjoyed your vacation. Goa has long been the land of sun, sand and frolic. It is a state with an ancient history but with a global touch. Indian cultures are so mingled with the Portuguese influence, that it is difficult to tell one apart from the other. For tourists from across the globe, Goa has long served as the vacation of bliss. It still retains the air of the hippie era, with its vivacity, its colors and its musical lifestyle. The cuisine of Goa has retained its Konkani and Portuguese roots and grown to inculcate global flavors to suit the palate of its many visitors. The Nagoa Grande Resort, Goa, has customized a package for this summer season which promises you the taste of all that is Goa. From a trip around its historical sights to a romp on the beaches, everything has been included in it to give you the best experience. You can use the tea coffee maker as you want. Enjoy a dip in our swimming pool or a game of billiards in our game room. Not using the transportation will not decrease the price. The prices are subject to changes in currency exchange and government rules. BookOtrip.in can modify or change the package without any notice. The beaches of Goa is amazing. beautiful sunset and the bike ride was great. Thank you bookotrip.